Global FAST - Our New Veterinary Ultrasound Exam! Increase your veterinary ultrasound skill set! The FASTVet Premium Membership includes AFAST®, TFAST®, Vet BLUE® and Global FAST® ultrasound-related, cutting-edge topics! Our resources offer practical tips and pearls that will expand your ultrasound proficiency! These techniques, AFAST®, TFAST®, Vet BLUE®, and Global FAST® rapidly answer critical clinical questions to favorably direct case management and help better pick the next best test and treatment. Global FAST Saves LivesTM! Over the past 13 years, we have lead the development, clinical research and validation of AFAST and its applied fluid scoring system, TFAST and Vet BLUE! Global FAST is the combined application of AFAST, TFAST and Vet BLUE as a single exam. There is so much clinical information to be gained by learning our systematic, standardized, Global FAST Approach! Within minutes a huge amount of clinically-relevant patient information is acquired, safely, with limited patient restraint, and little patient risk and no shaving! Global FAST is our new first line screening test and serves an extension of the physical exam! Global FAST®, the combination of AFAST®, TFAST® and Vet BLUE® as a 3rd standardized veterinary ultrasound exam used an extension of your physical exam, is cutting-edge and on par with many medical school curriculum throughout the U.S.A. including Harvard Medical School. Dr. Greg Lisciandro, DVM, Dipl. ABVP, ACVECC has practiced for ~ 27 years, half in general practice and half in emergency and critical care/referral settings. He learned ultrasound in 2005 halfway into his career AFTER failing an abdominal ultrasound course in 1999. He knows how to train you, what you see on a daily basis in general and speciality practices, and importantly what conditions you are missing EVERYDAY without ultrasound! Get Premium FASTVet Membership – Stay Connected! The Premium Membership supports continued advancement of your ultrasound and clinical skills by providing access to Live and Recorded Webinars, Emergency and Critical Care Blogs, AFAST® Video Library, TFAST® Video Library, and the Vet BLUE® Video Library, and NEW a member of our interactive closed to “FASTVet Members ONLY” private web page. Our Online Classroom has 7-hour RACE-approved course modules for AFAST® (Abdominal FAST), TFAST® (Thoracic FAST), and Vet BLUE® (lung) and Global FAST®. Global FAST is a single format combining AFAST, TFAST and Vet BLUE. RACE-approved 21-hours of Global FAST Modules available as self-paced courseware with quizzing. 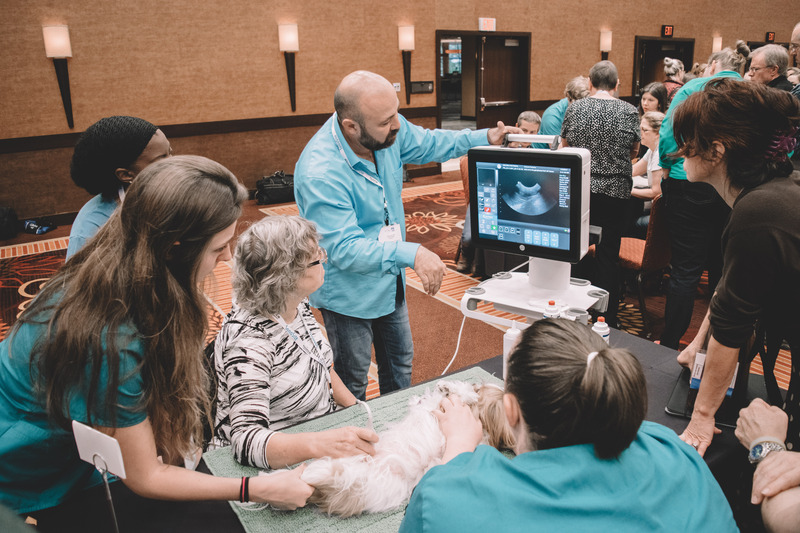 Join us for the All Day Fridays, 8-hours RACE-approved CE Hands-On Course at our FASTVet Academy in beautiful San Antonio, Texas. There is no better way to learn Global FAST than hands-on with proctored stations using live animals mimicking clinical practice situations. Dr. Greg Lisciandro will also travel for Onsite Global FAST Training at your practice. Global FAST is our NEW veterinary ultrasound format, that in reality should be applied to ALL small animals as an extension of the physical exam. The last major tool added for the physical exam was the stethoscope, invented over 200 years ago. The ultrasound probe is the next major advancement and long overdue, bringing with it "seeing" over "listening"... ...and with the Global FAST standardized approach, better ensures that the correct abnormal cavities and spaces, and organ systems are identified. Global FAST is for any and all practicing veterinarians from the general practitioner to the clinical specialist of all disciplines. That was a great talk! I think it was the finest lecture pertaining to POC (point-of-care) ultrasound that I’ve ever heard. Thanks again for your time, effort, and expertise. Will look forward to collaborating with you on future endeavors! Best regards, Steve Venticinque, M.D. We had Dr. Lisciandro join us as a guest lecturer upon the Grand Opening of our emergency and referral practice, and all of our veterinary staff has now been trained in the use of FAST exams and Vet Blue. Having FAST at our fingertips has allowed our staff to rapidly diagnose and intervene in critical emergencies efficiently, cost-effectively to our clients, and without great stress to our patients. It is an essential component to nearly all of our triaged cases and is now an integral part of our initial database. ”FAST” has made the use of ultrasonography more accessible and less intimidating to our ER vets, and it’s standardized approach makes transferring of cases between clinicians seamless and universal. In short, we could never go back to a”pre-FAST” way of practicing medicine. Thank you Greg for a great day of lectures and for a fantastic wet lab. We eagerly await your publication to add to our library! Listen to the Archived Webinars, and visit and participate in the Internal Medicine and ECC Blogs, and the Closed Interactive Web Page, for the latest topics and discussions.